It is going to be a sunny and warm long week-end of Easter, and just as leaves feel like bursting out of the buds and bathing in the sunshine, we will be many to take advantage of these lovely days to walk out in the open air, enjoying the breeze on our face. 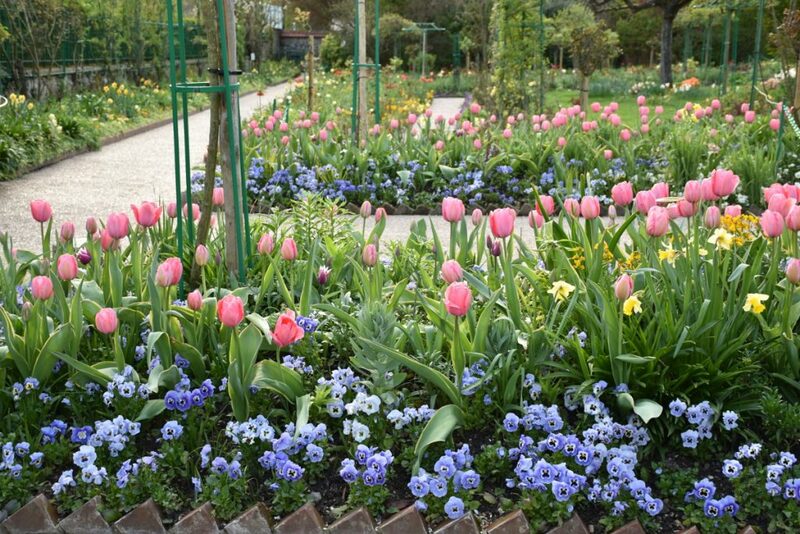 At Giverny, in Claude Monet’s garden, a special treat awaits visitors: many spring flowers are fragrant. Some smell like perfume, especially on sunny days. Flowers live their own lives. They want to attract pollinating insects. They make lots of efforts, they dress themselves in bright colors, they produce these intoxicating scents to obtain the favor of insects visit. As human beings, we are not involved in this process. We are just observers, fascinated by their beauty. 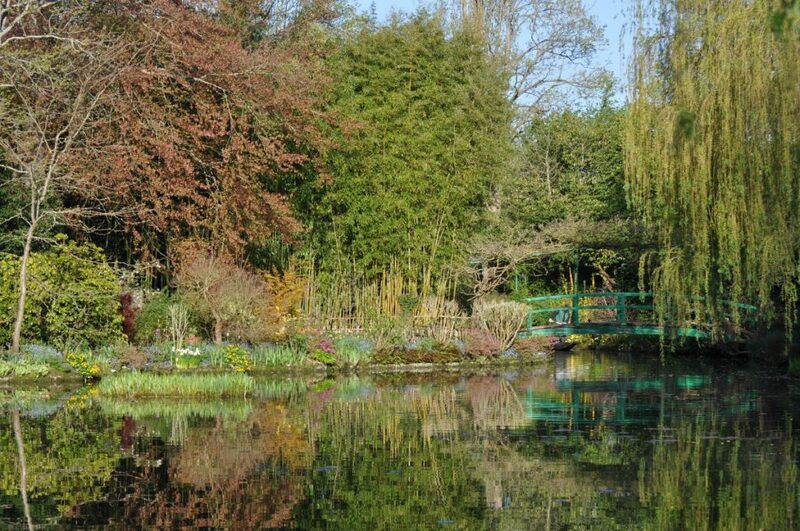 After all the colors of the flower garden, the water garden of Giverny is a peaceful heaven where to relax and daydream. 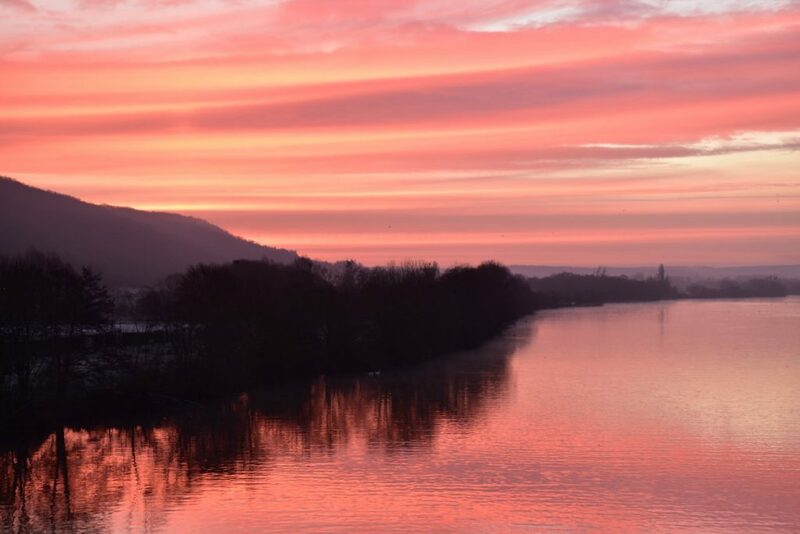 To make most of your day, come at opening time or in late afternoon. The best hour is the last one. 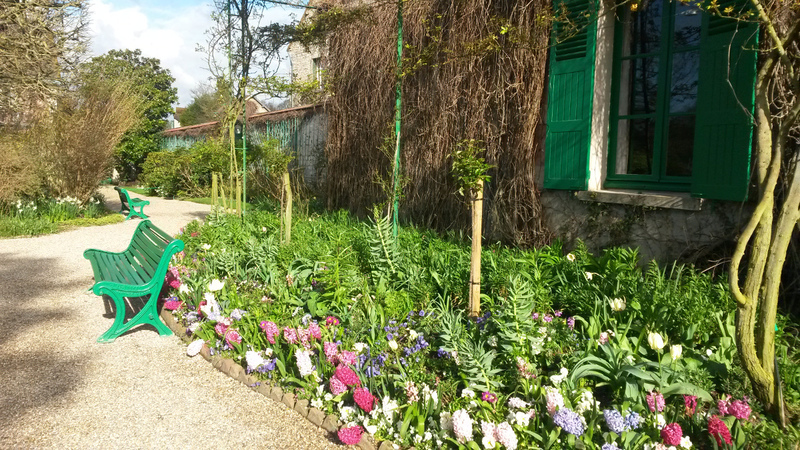 The first flowers are opening at Giverny! 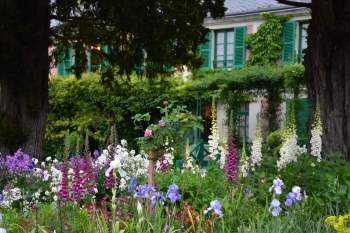 And so will Monet’s gardens and house very soon. Christmas roses, pansies, jonquils, daffodils, hyacinths and more are among the early spring flowers. 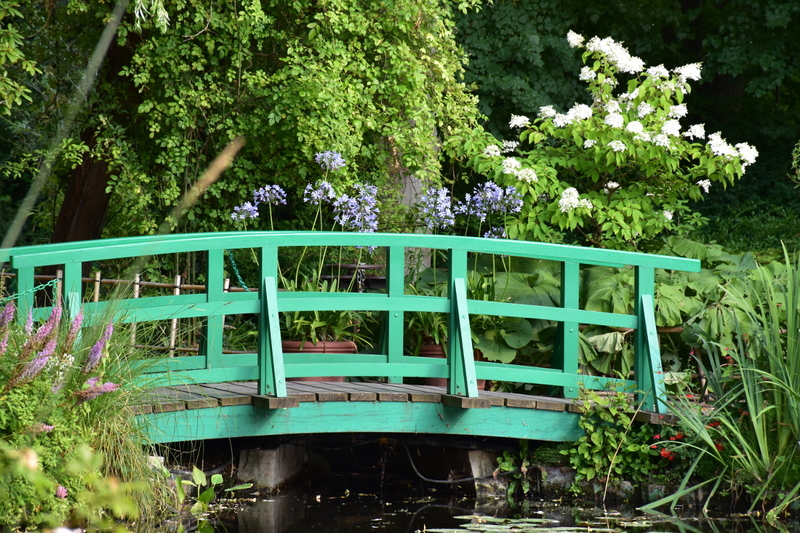 They give colors to Monet’s living painting, his own garden. I’m looking forward to seeing the 2019 show prepared by the 11 gardeners. Hope to see you too in the alleys! This unique cross stitch work features Monet’s house at Giverny. I shot it at an exhibition organised by a group of cross stitchers from Vernon. To see all the details, click to enlarge. For 2019, I wish you a lot of time to do all what you’ve been wanting to do for a long while. It may be sitting next to the fire place embroidering or organizing your next holiday… Enjoy this new year! Claude Monet’s water lily pond is especially gorgeous right now in October. 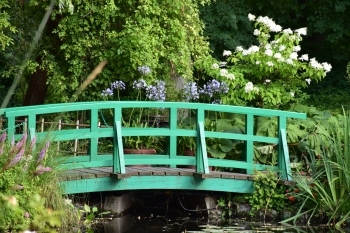 Giverny is open 7/7 until November 1st. 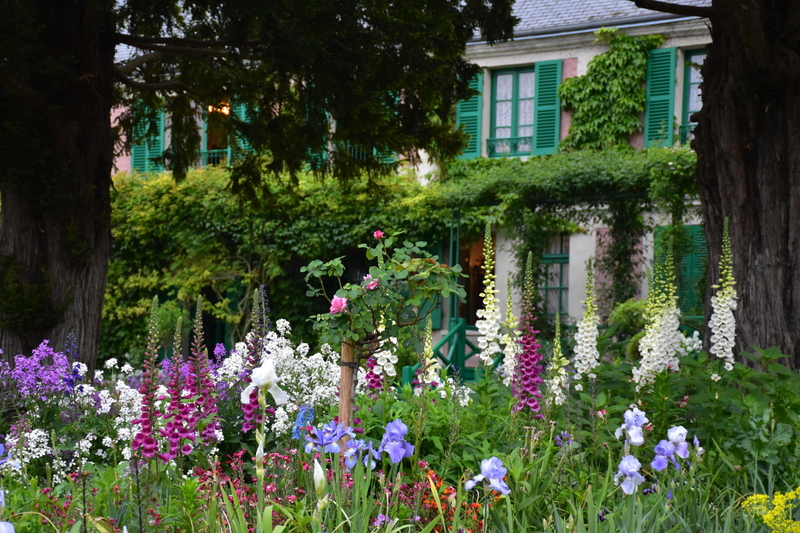 Monet’s house and gardens will close for the winter on November 2. This beautiful shrub grows in Claude Monet’s flower garden. It has not been planted for many years, so I wondered what could be the name of this new comer. I browsed the internet eagerly, without any success. The next day, by chance, I found it. 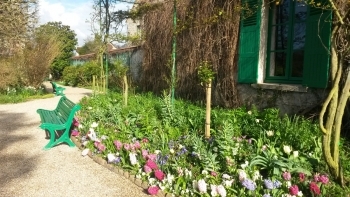 I was sipping an expresso on the terrasse of La Capucine, a coffee-shop at Giverny that also sells plants, when my eyes got caught by this big flowery plant that was displayed in the distance. 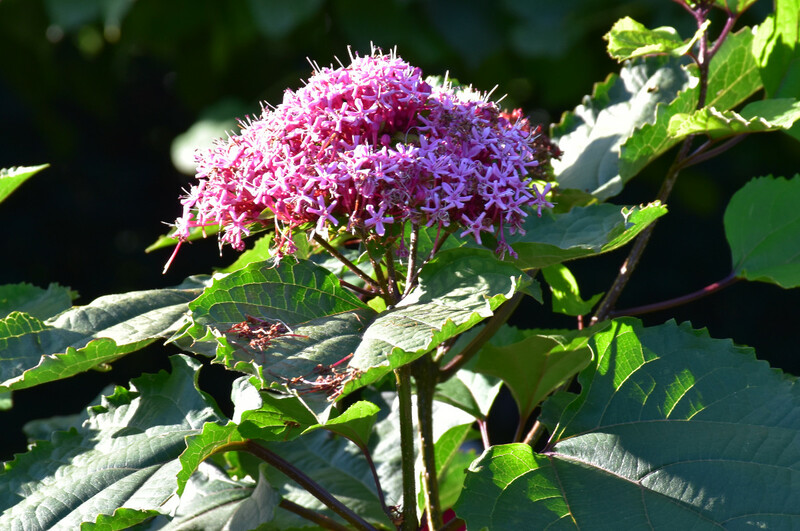 I jumped out of my seat, rushed to the pot, read the label, ‘Clerodendron’ ! It is such a joy when you experiment in your own life the help of up there. Now I’m posting in order to share and not to forget. The Tour de France in Vernon! On July 14 the Tour de France is passing through Vernon. The bridge over the Seine will be closed until 2.00 pm. If we were as light as a sparrow, we would be able to hold on to flower stems like this little guy on an allium in Claude Monet’s garden at Giverny.